In search of a new project having gotten tired of painting grey Space Marines, I opened a copy of White Dwarf for inspiration. White Dwarf number 98, I think. Featuring the first iteration of the Legion Of The Damned. In modern WH40K LOTD are flame-wreathed ghosts, using melta and flamer weapons. 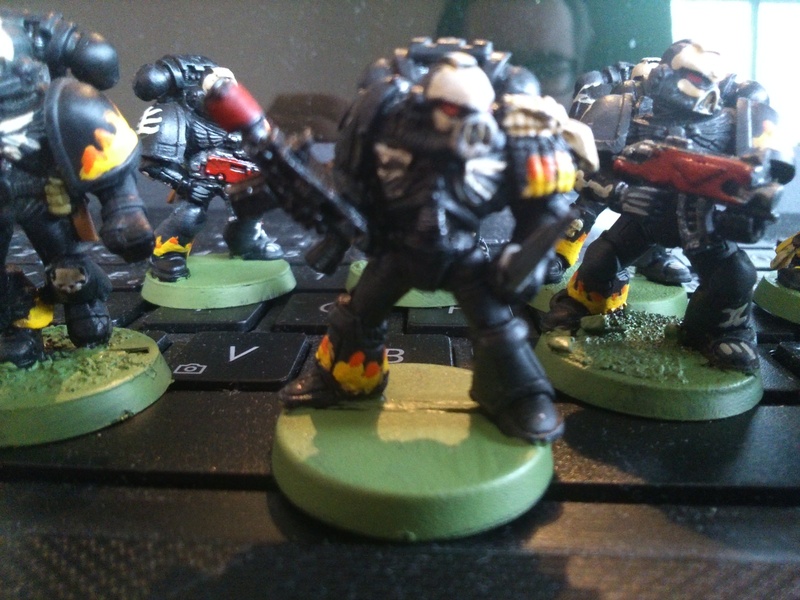 In their first version they were much simpler – normal marines, albeit pale sickly ones, who had painted their armour black with scary flame and bone logos. They had an awesome death frenzy special rule that meant that as long as there was another enemy within 4″ they would keep on killing. 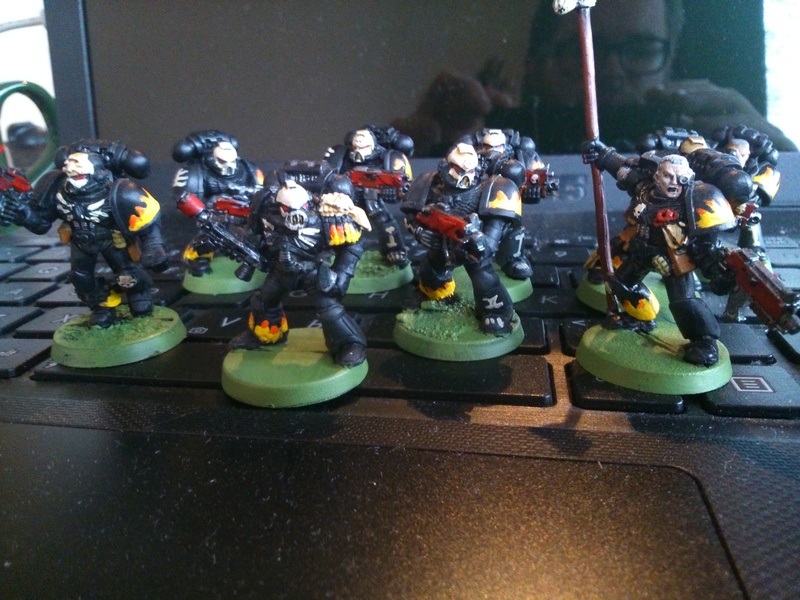 So I decided to paint up a squad according to the list given. This meant ten marines, armed only with bolters except for one special weapons marine. All black armour decorated with flames and bones. Any skin should be sickly and warp-tainted. How did I do? Painting black and getting subtle highlights was tricky – I drybrushed it in really dark greys. 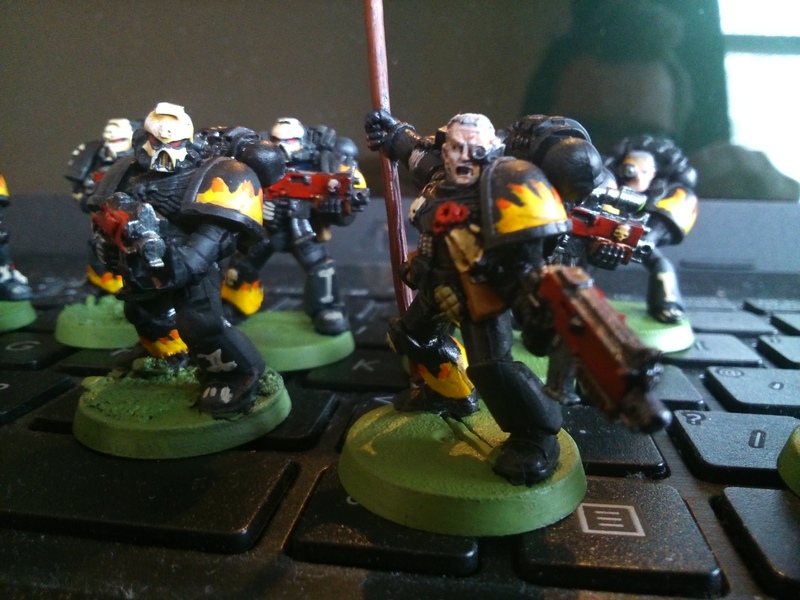 Painting flames was tricky too – they look alright from a distance but are pretty laughable up close. But painting bones and skulls were really hard. Still, i figured that the bones and skills weren’t meant to be photo-realistic! I enjoyed this challenge and will be doing similar again in the future. Currently on my painting table are a rebuild project – i was sent a tatty damaged Chaos Thug by a kind poster on the oldhammer forum and am rebuilding it and painting it. I have also decided to stay in the past, and am painting up Pedro Cantor and his squad as laid out in Rogue Trader: The Battle At The Farm. I’ve tried to use a good mix of miniatures from different eras. Lovely old Doom Eagle marine.